England goalkeeper Robert Green is set to be ruled out of the World Cup finals after rupturing his groin in the B international defeat by Belarus. The 26-year-old came on at half-time, but within minutes he collapsed taking a goal-kick, allowing Belarus to level. Green told BBC Sport: "I'm in agony. I felt it tweak as I made a save then it ripped. I'm devastated." 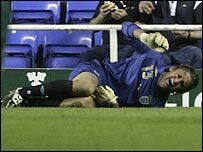 He will have a scan on Friday after which it is expected he will be ruled out and replaced by Scott Carson. Coach Sven-Goran Eriksson said: "He's almost certainly out. The scan will confirm it. It's a pity for him and us but Scott Carson can step in." Liverpool keeper Carson was Green's replacement at the Madejski Stadium and will become England's third-choice goalkeeper behind Paul Robinson and David James in Germany. However, it is not clear who will replace Carson on England's standby list. Green had not played for his club since the start of April because of an ankle injury. He has won one full cap for England in the 3-2 win over Colombia in New Jersey almost exactly a year ago.